Why Are Cabin Crew Using Mobile Phones Onboard Emirates Flights? Emirates is famed for having one of the best Business Class experiences in the sky but small mistakes do sometimes happen. And that one mistake can take the shine out of an entire journey, upsetting passengers that are a vital source of revenue for Emirates. It now looks like that’s a risk that Emirates is unwilling to take. And in an attempt to make the Business Class experience perfect, Emirates is taking its food and beverage operation high tech. Cabin crew have recently been spotted using smartphones in the cabin but they’re not catching up on social media. In fact, they’re using a new tool that Emirates hopes is going to enhance the Business Class experience. 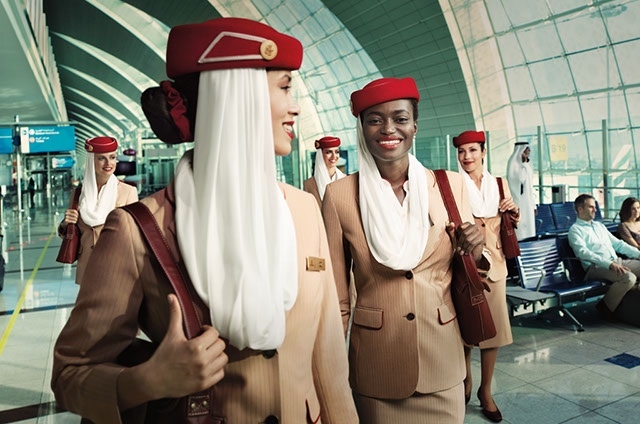 “Providing our customers with the best onboard service has always been our top priority and we provide our cabin crew with the right tools, knowledge and information to do a world-class job.” said Terry Daly, Divisional Senior Vice President, Service Delivery at Emirates. An Emirates spokesperson said that the new devices will be rolled out across the network in the next few months. Here’s how it works: The smartphones don’t have a SIM card and have been blocked from running any applications apart from the Meal Ordering app. Cabin Crew connect their smartphone to a plug-and-play WiFi router which is separate from the onboard system that passengers use. The smartphones don’t connect directly to the internet – so even in regions like India and China the meal ordering devices can still be used. A Samsung A7 Galaxy Smartphone. Being used as a Meal Ordering Devices by Emirates. All the phones are synced to communicate with one another for the duration of the flight – which in theory should create a seamless experience. When the passenger sat in 10G requests his G&T, the order gets sent directly to a smartphone in a galley. Within minutes the drink should be made and on the way back to the passenger. The bespoke Meal Ordering Device app details the Business Class cabin and comes loaded with the PNR information for the flight ahead. Every combination of food and beverage has been accounted for. And there’s plenty of options for customisation. Even the fussiest of passengers will have no problem requesting their beverage just the way they like it. Some Teething Problems Still Exist. Cabin Crew have received a one-day, hands-on training course for the new devices but there are some teething problems still to be ironed out. On some flights, the Meal Ordering Devices have not worked at all. In other cases, orders have been lost in the system and there have been delays in orders being sent to the galley. However, it looks like this innovation won’t be coming to either the Economy or First Class cabins anytime soon.